Blousing the boots is a requirement for the majority of the people serving in the military and marines. It is the act of tucking in the pants into the ankle holes of the boots to create a balloon like effect. Of course, blousing is required not just for the cool look, but in order to keep the person protected from various crawling insects, animals and debris. Blousing also helps keep the warm inside in cases of cold weather, plus it ensures that the person is not slowed down or accidentally tripped in flapping pant legs during their service work. If you are new to the service, you may be asking yourself how to properly blouse your boots. 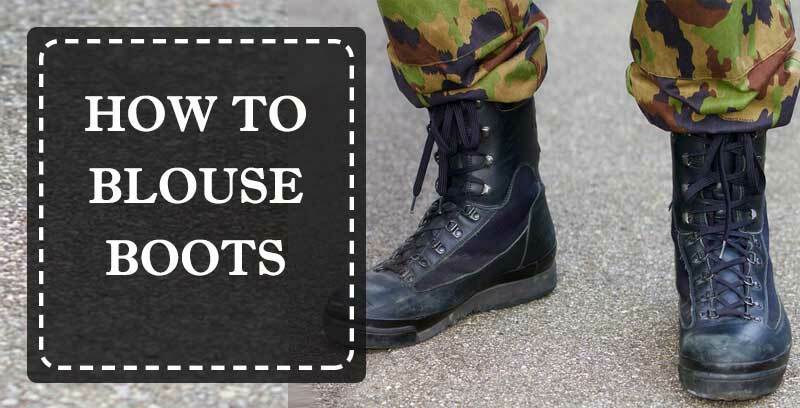 Well, here are a few basic tips to follow, which will teach you to blouse your boots properly and in accordance to the rules for your service uniforms. Why you should blouse your boots? Step 1 Put your service uniform including your socks on. Step 5 If you are using a rubber band or drawstring, slide it on up to the ankle cuff over the rim of the tactical boot. Blousing can prevent debris and insects crawling up on to your legs or entering your boots. This can keep you safe from insect and other bites, as well as for annoying pebbles and other debris entering your boots. Blousing also keeps the warmth inside your pants when you are outdoors in cold weather. It is recommended that you wear socks with mid-calf length or socks which come over the calf. Pull the pant leg over the sock. Keep the laces of your boots loose at this point. Blousing is easier if you sit on a chair or bed. Do this if you are not planning on using bands or blousers. Smooth out your pant legs as you are tugging them to the back and make sure that any creases are smoothed. Pull the front part of the material of your pant leg and place the excess inside the front of the boot. Try tucking it in as flatly as possible. Lace up your boots and make sure you don’t tie them too tightly in order to keep your feet and ankles comfortable and to ensure there is sufficient blood flow to your feet. A rule of the thumb to follow is to pull up the pant leg at two to six inches above the boot, so that it looks and feels nice and comfortable. If you are going to use a blouser, put in on the foot up to your lower calf or if you prefer over your combat or police boot. After that place a string around your leg at the upper part of the boot. Tie it and then tuck it under the cuff of your pant leg. Spread the pant leg to create a balloon like effect. Make sure you straighten any creases or folds. Make sure you do the same for the other pant leg for a presentable, symmetric appearance. Cover the band or string with the excess material from the pant legs. Some people prefer to use blousing weights for a nice square-like effect. This method includes putting on your uniform pants and then the combat boots, tucking the pant legs in them and lacing them up. This is followed by taking the pants back down over the boots and pulling the trouser legs so that their hems are about two to six inches above the boots after which the rubber band or blousing strap is placed on the lower calf right above the boot. The weights are wrapped in tape and strapped around the calf. After that the pants are pulled back on, buckled and buttoned properly and the weights are adjusted around the calf in order to achieve the best presentation possible. Blousing the pants is something every person in the military or marines needs to master in order to achieve that sharp presentable look on a daily basis. It is a matter of some practice, but soon enough each person will find their own best alternative for blousing, which is not surprising as it will turn into a daily routine for most people in the services.